• GET MORE DONE IN HALF THE TIME taking fewer trips with its true commercial durability and tractor-grade run-flat pneumatic tires. 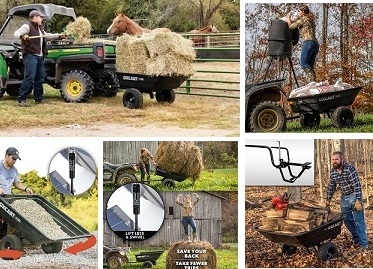 • GET MORE DONE WITH HALF THE EFFORT with its true innovative hydraulic-assisted tub lift and swivel design that makes handling heavy loads feel up to 90% lighter. 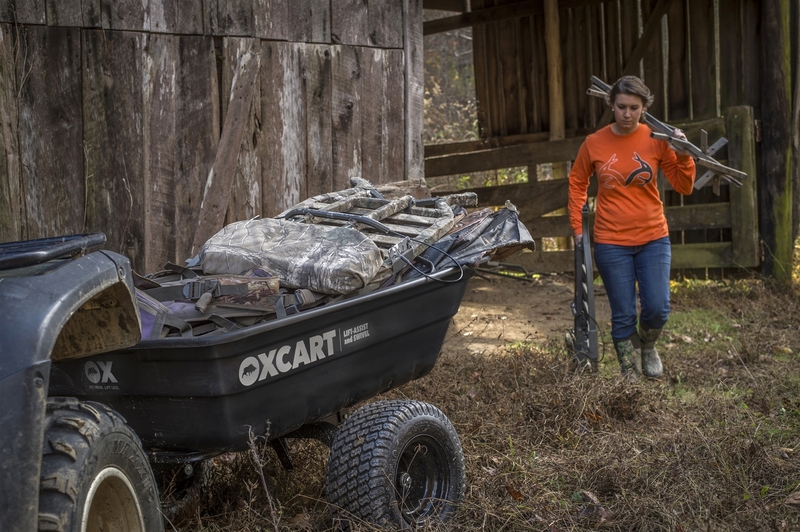 Take fewer trips hauling deer corn, working the food plot or even hauling hay bales. The cart is load-tested to 1100lbs. and is designed with professional-grade all-square-tube steel construction. The 2 inch NASCAR roll cage full-mandrel-designed bent-axel support and power-coated finish provide superior strength and durability. Check out How It Works Video. Hydraulic lift-assist makes handling gravel, dirt, sand, pavers easy to swivel and dump safely with less fatigue to finish sooner. 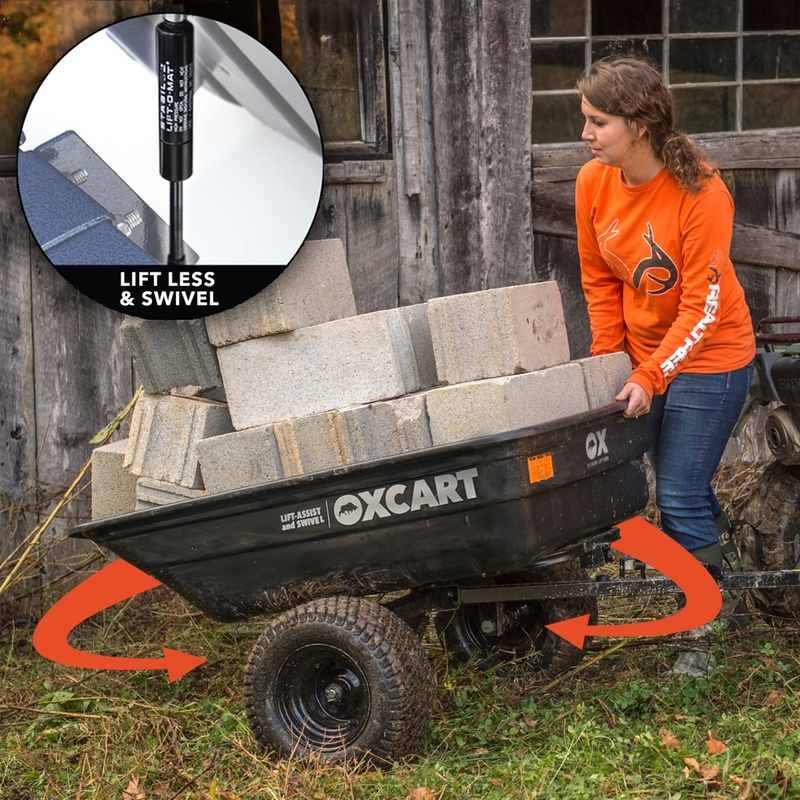 Works great for checking fence lines or hauling firewood thanks to bigger, rugged 12-14-cubic-foot tub, which swivels 110° for less backing. Run-flat tractor grade pneumatic tires and grease zerks ($100 value). Liquid polymer self-seals most nail or deer shed punctures instantly/permanently before losing any air. Checkout our Nail Test Video! • Assembles in 10 - 15 min. 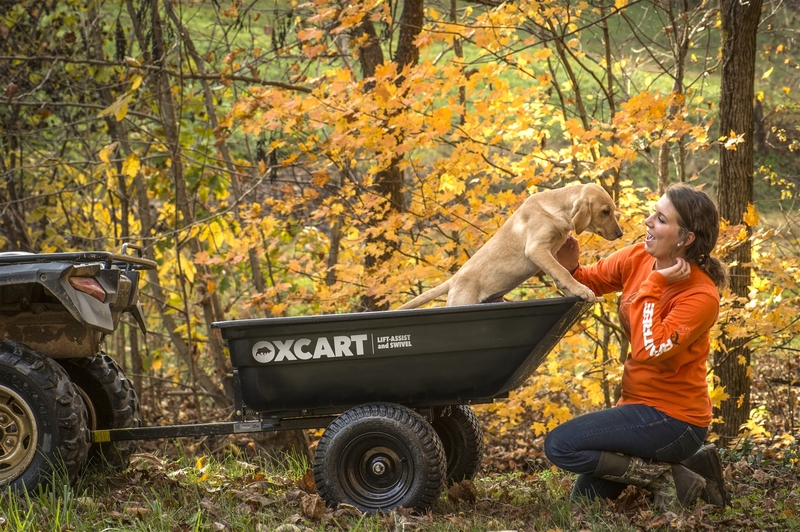 Check out OxCart.com for our Easy Assembly video. • Attaches to any mower, ZTR, or ATV with a pin-hole hitch. Couplers mount easy for 1 7/8 and 2 inch ball hitches. Assembles in 10 - 15 min. 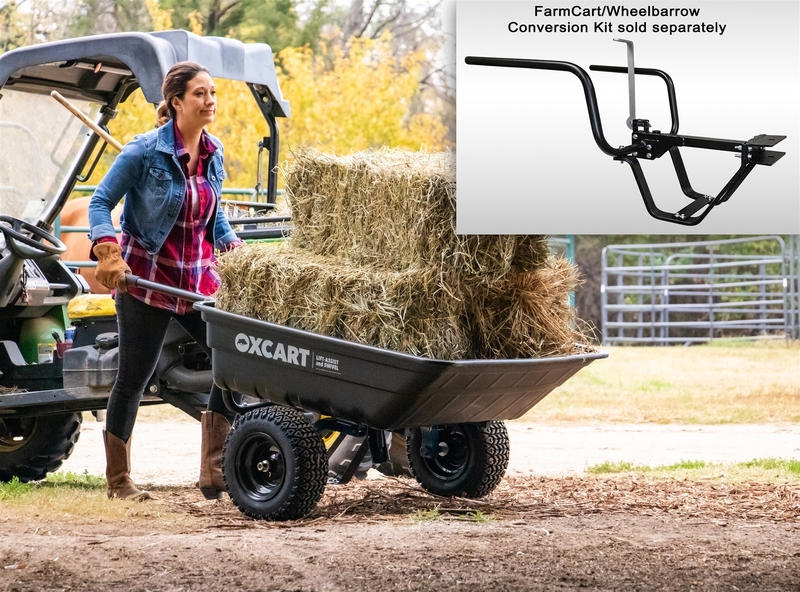 Check out OxCart.com for our Easy Assembly video. Attaches to any mower, ZTR, or ATV with a pin-hole hitch. Couplers mount easy for 1 7/8 and 2 inch ball hitches. Taking fewer trips with its true commercial durability and tractor-grade run-flat pneumatic tires. With its true innovative hydraulic-assisted tub lift and swivel design that makes handling heavy loads feel up to 90% lighter. I have a small hobby farm where I have an organic fruit tree orchard and honey bees. This cart is the perfect size for the items I need to hall around to maintain the property. The product is as advertised. Very strong, quality materials that are heavy duty, and engineered with the consumer in mind. I also purchased the wheelbarrow attachment and cargo cover. The hydraulic lift-assist and swivel design makes work so much easier. Utilizing the lift-assist on the wheelbarrow is amazing. I was pleasantly surprised when I called Oxcart about an issue. I left a message and they called me back in a short time. They were very concerned, took care of my issue and gave me additional ideas on how I could use the cart for my intended purpose. It is rare today to have a company even call you back let alone spend time on the phone discussing how to better use their product. It's so professional-grade and innovative in handling heavy loads, it's the last cart I'll ever buy. I may get another one just to cover my orchard better. 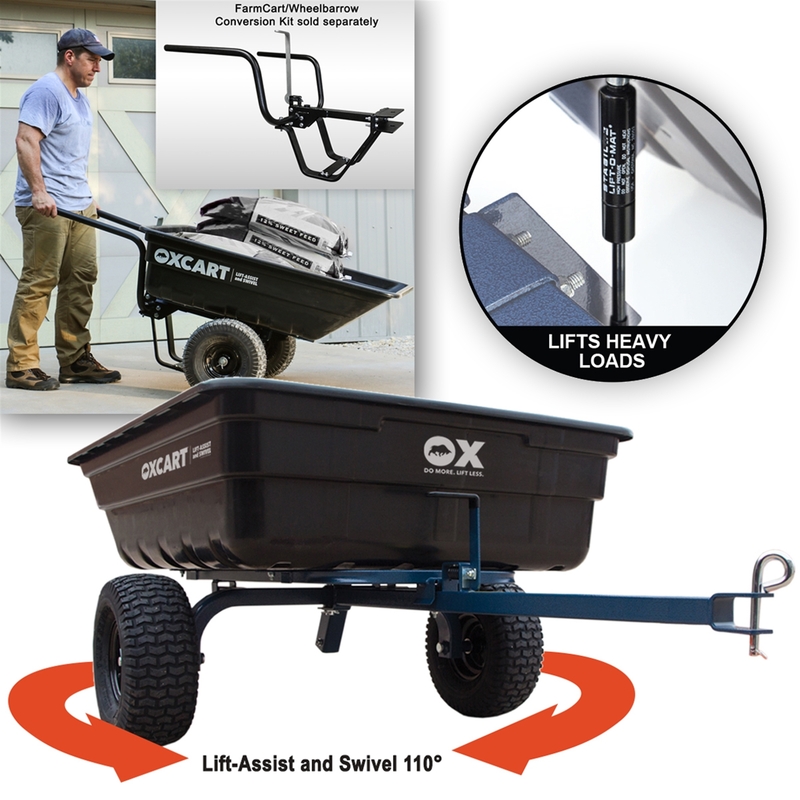 The OxCart Lift-Assist and Swivel dump trailer is an impressive product. It's nice that the tub swivels up to 55 degrees to either side. And the hydraulic lift-assist tub makes handling and dumping a breeze. It's said to be load-tested to 1,100 pounds. It's handled heavy loads easy, it's always held whatever I hauled. Run-flat tires are worth it alone! The best part in my opinion? It assembles quickly and converts to a wheelbarrow if you choose to do so. It even comes in Realtree camo.